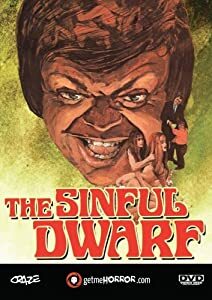 Dwarf Olaf lives with his boozy, aged mother, who runs both a bed & breakfast (well, more of a flophouse / rooming house) and also, in its attic, a heroin slavery ring. Olaf does her bidding, securing women for mom’s business. A couple in financial straits has to stay at this place until the husband finds more consistent employment (must be tough, he’s a TV writer). When he’s away on business, the missus is turned out. Experience “the mother of all Dwarfsploitation films” with us.